"The eagerness occurs every time we get ready for a race. That typically is about a month before we start getting ready; there's an excitement that you can see just start to infuse itself amongst our team members." I asked what they're eager for — a win? The experience? Just to be out on track? "Our first perspective is to finish, and to improve. Our thought process is to always be better than the last race. If we can do that, we've come away a success. Perfect case in point, we've got a car that just got burned up and we're going home, but we felt, quite honestly, that we performed better than we did last year…"
The 25 Hours of Thunderhill is a race that is nothing if not difficult. But Singh's response reminded me that it's the combination of eagerness and opportunity that brings teams to the race in the first place. The teams that only see the difficulty don't show up, and the teams that focus on the opportunity come back year after year, even when things don't go as planned. The V/M Racing Lotus Exige is one of the most easily-recognizable vehicles in the race. The mirror finish glistens at the start of every race that I've seen it contest. 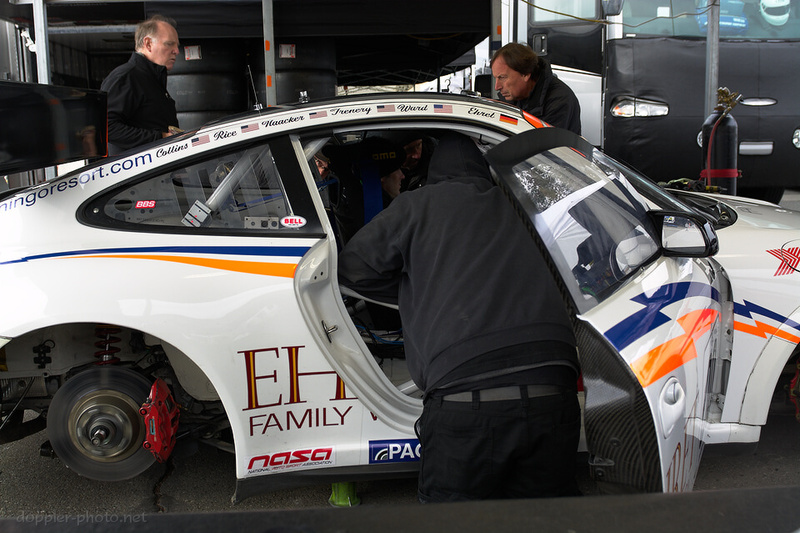 It's easy to imagine that the team's eagerness to improve also motivates a certain level of pride in their vehicle. 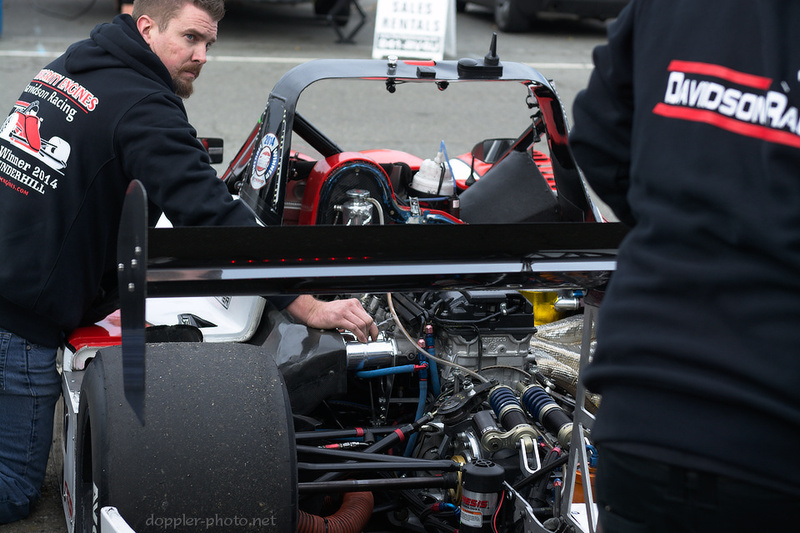 Unfortunately, the team's race came to an untimely end at Thunderhill's corner 1, after an engine failure spilled hot oil onto an even hotter exhaust manifold, causing an immediate, intense fire. 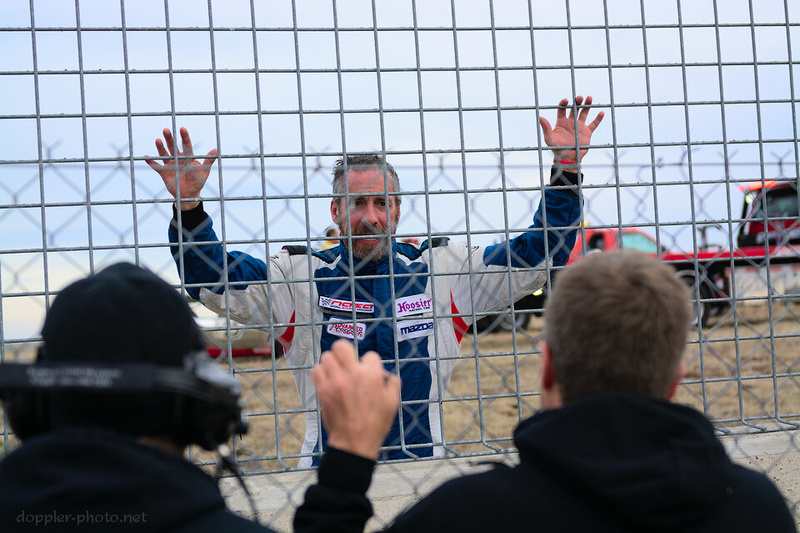 The driver (pictured) drove straight off the track and jumped out; it was the only time I've heard the Thunderhill safety crew use an audible siren while responding to a situation. Back at the team's paddock space, other teammates noticed that the back of the driver's Nomex racing suit had been singed from the heat. This was the first year for the Ryno Racing team's Ginetta LMP3, and it was set to be a good one, with the car starting on the front row. Once the flag dropped, the car demonstrated the speed to stay near the head of the field. But as day turned to dusk, a slight misjudgment on the corner leading into the front straight sent the car spinning straight into the hot pit wall, causing damage on all four sides. During the team's wrap-up meeting, the summary was pretty matter-of-fact: it was a racing incident; these things happen. We'll be back next year. 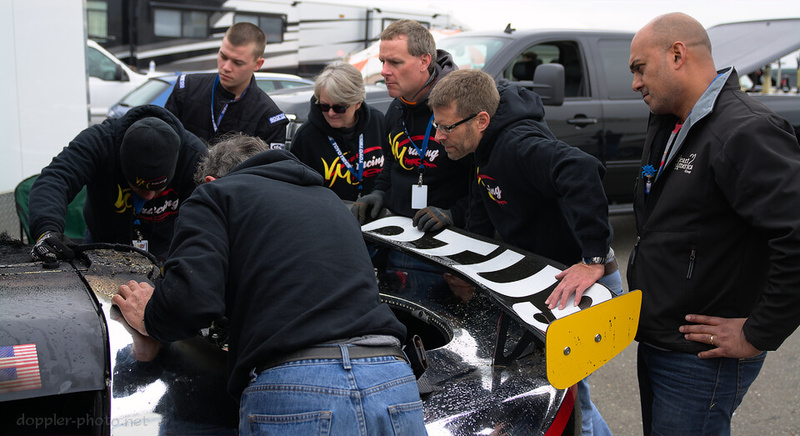 Fresh off their 2014 victory, the Davidson Racing team was gunning for another great result. Around the team's paddock area, you could sense a bit of tension as they started their engines and warmed up their two cars. Once on the track, though, both cars were turning incredibly fast laps — fastest overall for the #17 car (pictured), and within the top 5 for the #16. That good form didn't last, though. 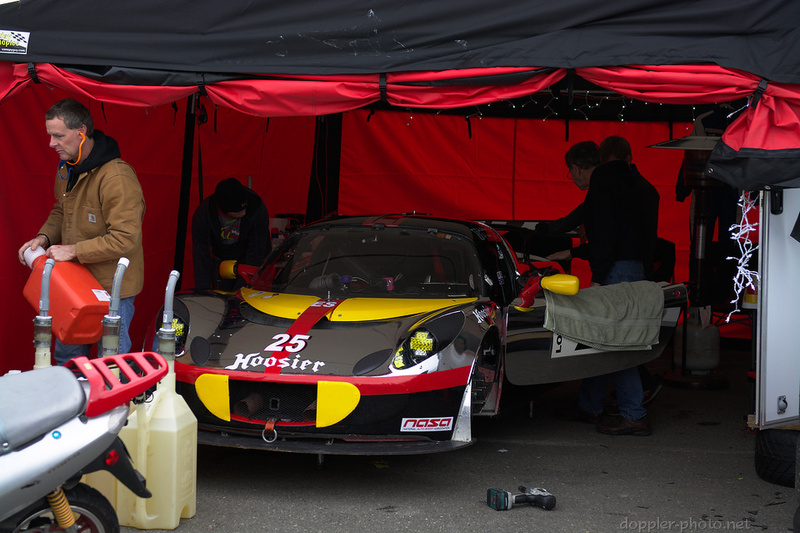 The cars experienced electrical and mechanical issues, which ended the team's hopes for another podium. The #16 (on the lift, in the photo) was retired first, and the #17 (under the canopy) would follow. 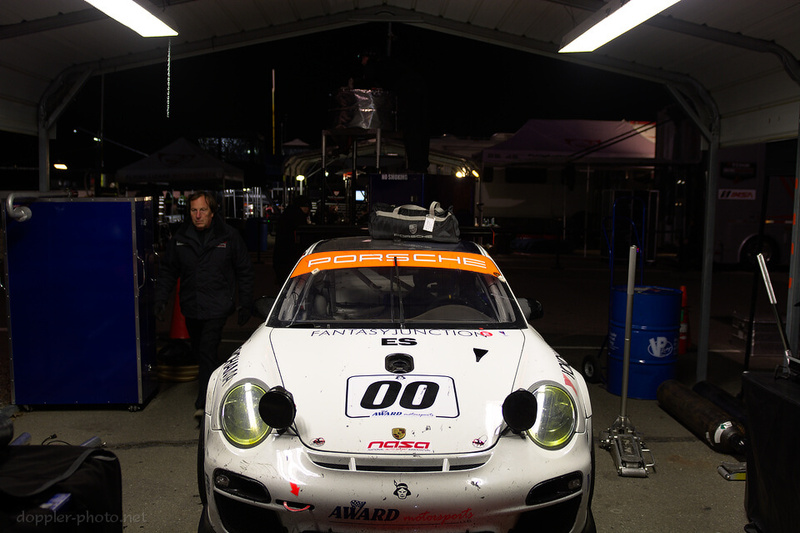 The #00 Porsche GT3 Cup car, fielded by Award Motorsports / Ehret Family Winery, was also looking for a repeat. 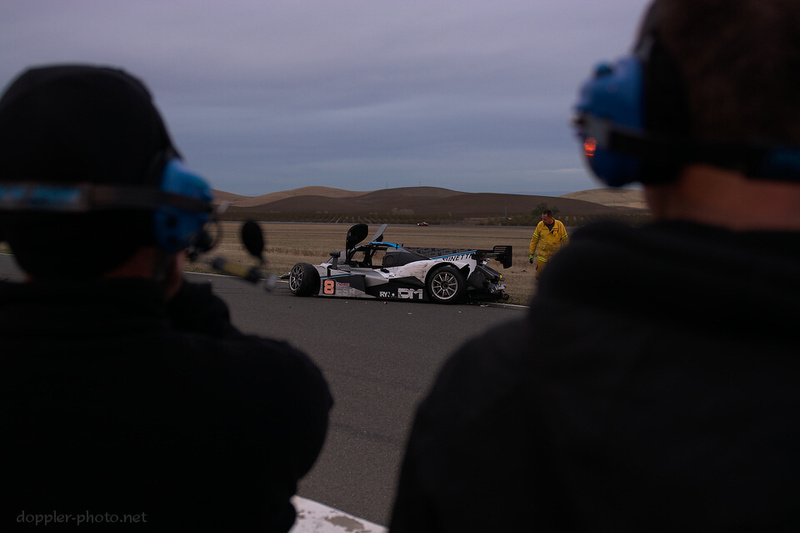 I saw the car take the outright at my first 25 Hours of Thunderhill, back in 2012. It had always been a car that combined speed with reliability. Sometimes speed and reliability aren't enough, though. The team was forced to retire, by race rules, after three incidences of significant vehicle-to-vehicle contact.